About the editors RICHARD C. DORF is Professor of Electrical and Computer Engineering and Professor of Management at the University of California, Davis. He is also the author of Modern Control Systems, Seventh Edition; Electrical Circuits, Second Edition; The Encyclopedia of Robotics and Automation; and the Handbook of Electrical Engineering. He is a Fellow of the Institute of Electrical and Electronics Engineers and a member of the Robotics Institute of America and the American Society of Electrical Engineers. Dr. Dorf received his PhD in electrical engineering from the U.S. Naval Postgraduate School in 1961. ANDREW KUSIAK is Professor and Chairman of the Department of Industrial Engineering at the University of Iowa in Iowa City. He received his BS and MS in precision and mechanical engineering respectively, from the Warsaw Technical University and his PhD in operations research from the Polish Academy of Sciences. He edited Intelligent Design and Manufacturing, Concurrent Engineering: Automation, Tools, and Techniques, and a number of other books and technical papers. Dr. Kusiak is a member of the American Association of Artificial Intelligence, Society of Manufacturing Engineers, Institute of Industrial Engineers, Institute of Electrical and Electronics Engineers, International Federation of Information Processing, and the International Federation of Automation Control. Design for Manufacturing (Y. Hazony). Nontraditional Manufacturing Processes (K. Rajurkar). Micromanufacturing (J. Jora-Almonte, et al.). Analysis and Design of Manufacturing Systems (K. Hitomi). PLANNING, SCHEDULING, AND CONTROL OF MANUFACTURING SYSTEMS. Automated CAD-Based Vision Inspections (J. Ventura &J.-M.
Computer Networks in Manufacturing (S. Yeralan). BUSINESS ASPECTS OF DESIGN AND MANUFACTURING. Managing Advanced Manufacturing Technology (D. Gerwin). TOOLS AND TECHNIQUES FOR DESIGN AND MANUFACTURING. Artificial Intelligence Techniques for Manufacturing EquipmentDiagnostics (A. Bajpai). 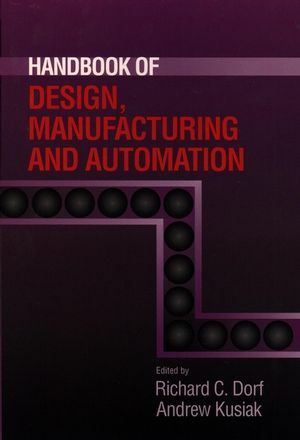 Standards and Prenorms in Design, Manufacturing, and Automation (F.Vernadat).